605 Companies, Inc of Sioux Falls, SD installs custom finish carpentry. Anything from a basic staircase to a high-end spiral staircase, custom fireplace mantels, and precision trim work…we deliver the highest craftsmanship. We install all product woodwork (the woodwork you touch or see in a home or business) that includes trim, cabinets, doors, and staircases. 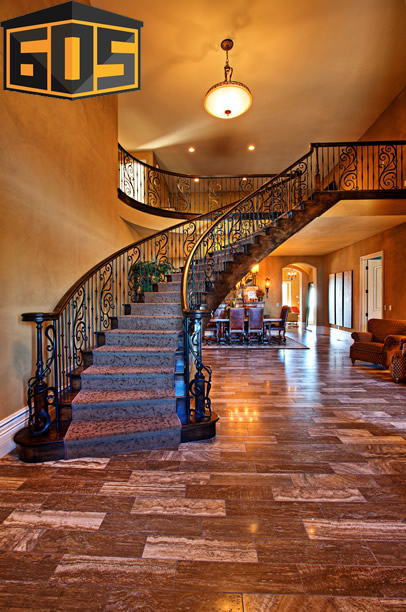 We also incorporate our carpentry team when finishing basements throughout the Sioux Empire. 605 Companies carries Wellborn Cabinet, Inc. Since 1961, the Wellborn family has owned and operated Wellborn Cabinet, Inc., located in Ashland, Alabama. Their goal is to provide kitchen and bath cabinets crafted by dedicated Wellborn employees with the utmost quality and care. Today, over 50 years later, Wellborn product line has broadened to include cabinetry and storage solutions to help you maximize your total home living space. Dan Jansma is our finish carpentry expert, he’s been installing custom finish work for 25 years. He’s timely and efficient, but never sacrifices quality.